The Corn and Beans quilt block has been around for many years. It is a four patch pattern, that is usually made using two opposite colour groupings in the four quadrants of the block. 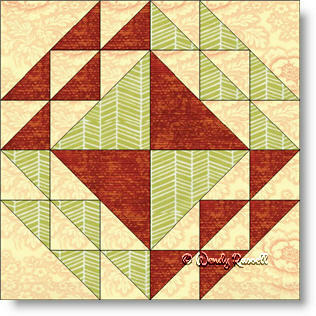 The quilt block is made entirely of triangles, using different sized half square triangle units. It is an easy block, but care must be taken in order to achieve the desired precision. The two sample quilt layouts show what a varied end result you can achieve by placing the quilt blocks in an entirely different manner. Let the experimentation begin!